I last posted a skincare routine back in November last year but I've been using some different products since Christmas so now I've had a good few months of testing them out I thought it was time to share my thoughts. This time I'm just going to let you in on my morning moisturising marvels as they have been the constants in my routine that have been providing some much needed moisturisation to my dehydrated skin. 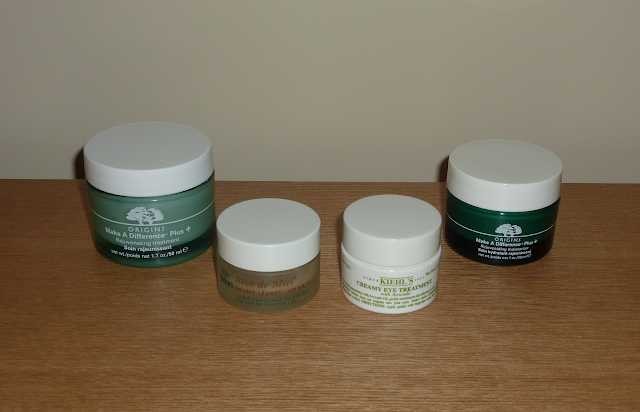 My first step after cleansing and toning is applying the Origins Make a Difference Plus + Rejuvenating Treatment. I use this in place of a serum for an extra level of hydration before applying regular moisturiser. This is a beautiful, lightweight, gel-like lotion. It's very cooling and it leaves my skin silky soft but never greasy. I love the scent of this product as it's very fresh and almost smells a bit fruity. A little goes a long way with this and I've hardly made a dent in this 50ml pot, despite using it for four months! This has a shelf life of 24 months once opened so I'm not in a hurry to get it all used up fast which is great and I can see myself using this whole tub up as I love it! Next up I use the Origins Make a Difference Plus + Rejuvenating Moisturiser which has the same delightful scent as the Treatment. The consistency of this product is thicker than the Treatment as it's more of a cream which feels very soothing on the skin and deeply moisturises without leaving your face looking shiny. I love the combination of these two products as my skin feels comfortable all day with no dry or tight skin in sight. I find that the skin round my eyes lacks in moisture and has dark circles so I need to apply an eye cream before I can try and cover up the darkness with concealer. 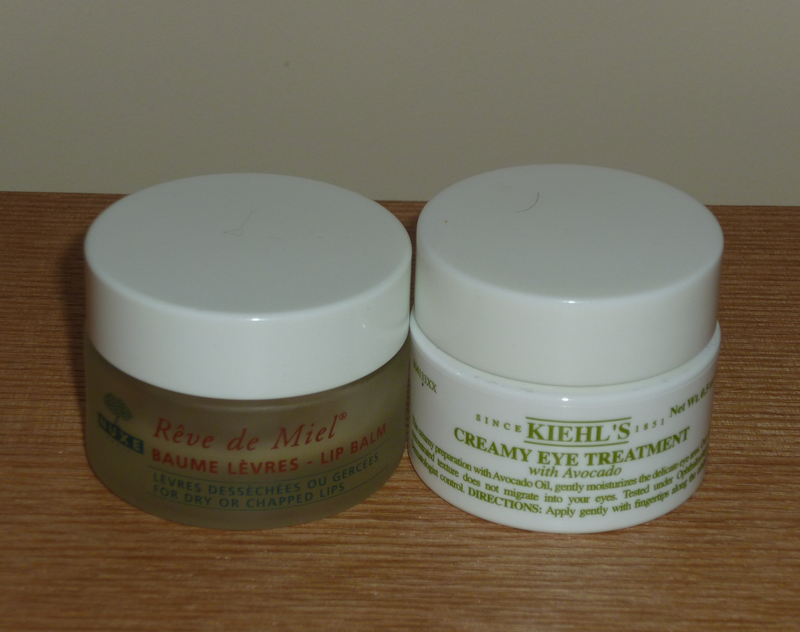 My current eye cream is the Kiehl's Creamy Eye Treatment with Avocado. I've found that my eye area requires quite a thick, moisturising cream to fully hydrate it and have never liked gel/serum type products on this area. This Kiehl's product is quite unique in terms of its consistency. When you first dip your finger in the pot, you feel a thick cream which when worked into the skin gently turns into more of a light serum. This concentrated formula delivers the perfect amount of moisture to my eye area and I'd go as far as saying it's the best eye cream I've ever tried, and I've tried quite a few! My only criticism of this product would be it's short shelf life of 6 months once opened but I'll overlook that as it's due to using naturally derived ingredients and minimal preservatives. I reckon this product would last me a year so as long as I don't have any issues with it, I'll keep using it past the 6 months. 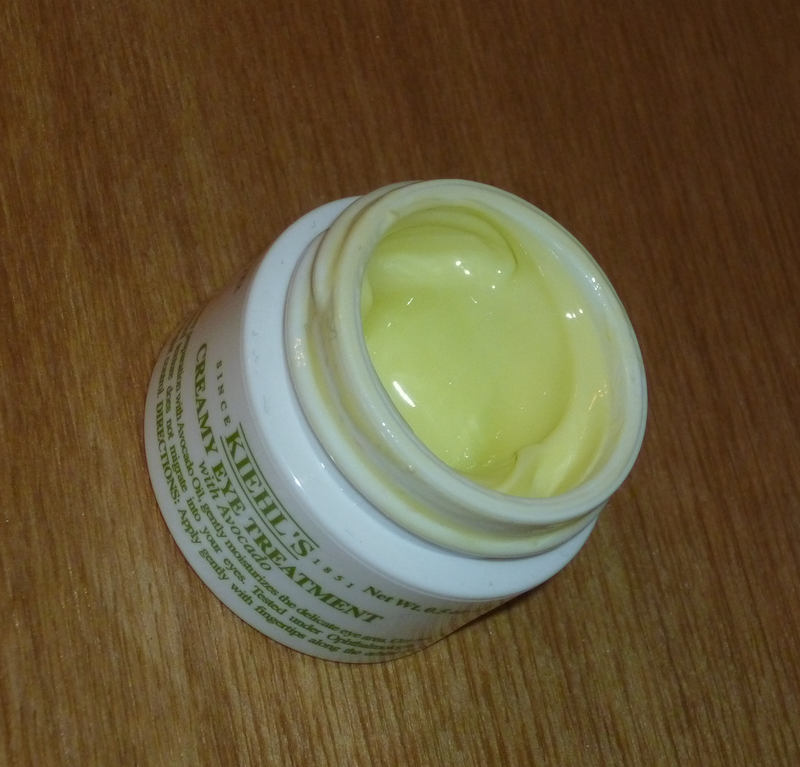 My final step is the Nuxe Rêve de Miel Lip Balm which does a great job at keeping my lips super moisturised and ready for any lip products I want to use. It has a gorgeous orange scent and is quite a thick balm that you really need to spread around to make sure you don't have big clumps of it on your lips but it's the best lip balm I've ever used and I'm quite gutted I'm almost at the end of this pot. This is possibly the first pot of lipbalm I've used all the way to the end as I normally get bored and want to try something new! Don't get me wrong, I've still bought plenty of new products but I still want to use this on a daily basis! I bought it in Paris last year so everytime I use it, it brings back great memories (and makes me want to go back!!). What products are you loving in your skincare routine at the moment? I have dehydrated skin that generally stays free from spots on most areas of my face but I frequently get spots on my chin. Spots in this area are said to be hormonal ones so there's not a lot I can do about them but they get super sore sometimes. They are often the kind that are really big under the surface and take days to appear. They tend to make half of my face feel tender and swollen, ouch! When I was offered a bottle of Skinetica, an anti-blemish skincare treatment, I jumped at the chance as I need all of the help I can get! 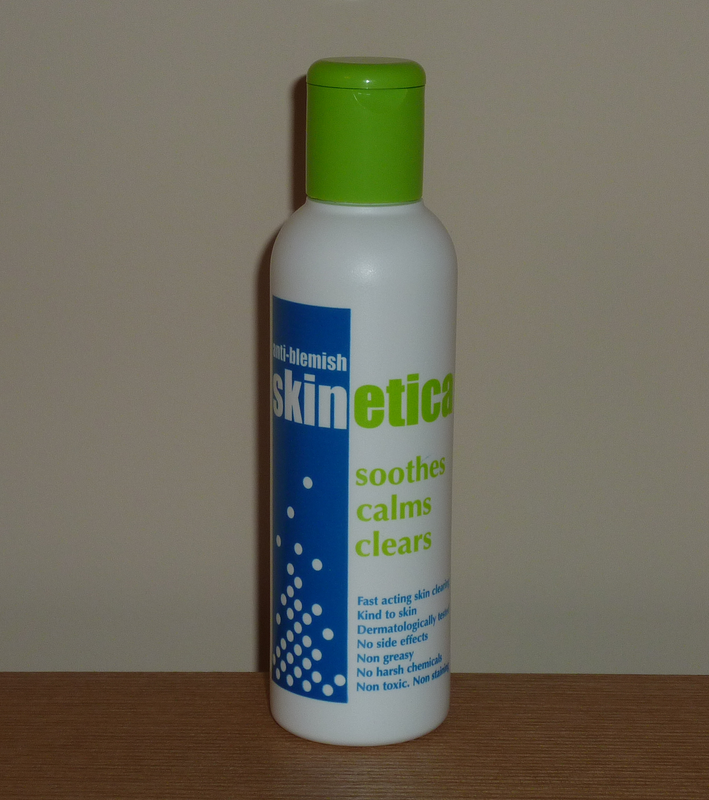 Skinetica is a clear, toner like lotion that you apply to blemished skin with a cotton pad. You can reapply this every 12 hours. The only other product I currently have in this sort of category is the Origins Super Spot Remover so I'm going to make quite a few comparisons to that. I really like the fact that this is a clear liquid as it means you can apply it day or night without having to be seen with spot treatment on! Although the Origins Super Spot Remover is clear too, I felt like I couldn't wear that during the day as it would take ages to dry and it would really dry out the skin and leave it looking a bit crusty. Skinetica does not dry out the skin at all and it doesn't leave your face wet for ages either. One thing I was surprised about with Skinetica is that it does not sting the skin. Normally with spot treatments (including the Origins one! ), they really feel like they are burning the skin as the air hits the product but this is one super comfortable to wear and I didn't feel any burning or irritation. 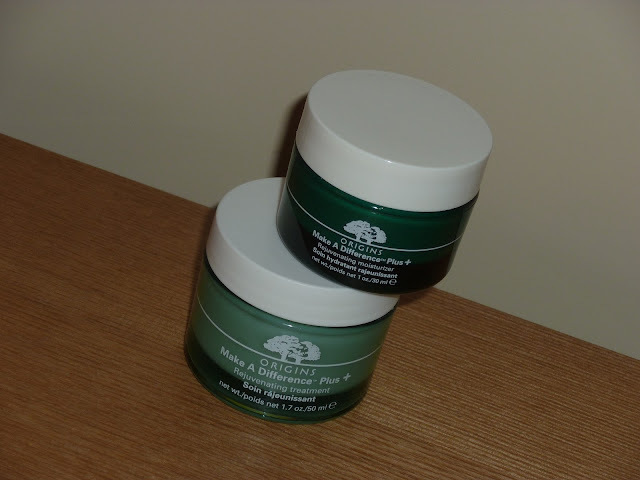 On those horrible spots that lurk under the surface of the skin, this is a saviour as it really tones down the pain and redness. I really enjoyed using it on those spots for the relief it provided! I wouldn't say it's a miracle worker on spots that have already surfaced though, it doesn't massively speed up the process of getting rid of them but I'm glad I have this as I feel it helps keep the area clean and soothed. I have to say, I don't think any product gets rid of spots overnight though! This is definitely the best spot treatment I've used and I'm glad to have a nice big bottle of the stuff as it will last a long time. An 80ml bottle costs £9.99 from the Skinetica website and I think this is great value in comparison to the tiny Origins Super Spot Remover where you only get 10ml for £13. You don't feel like you have to ration this product in order to make it last for ages! Have you tried Skinetica? What do you normally use on your spots/blemishes? Sorry it's been a while since my last proper post. I've been feeling under the weather lately and before that I moved flats so it was all a bit hectic! To get me back into the swing of blogging, I thought I'd write about the next lot of products I've used up. I'm finding it really satisfying using things up as I'm sick of wasting things when I move on to the next new product! I'll start off with the skincare bits I've used up. 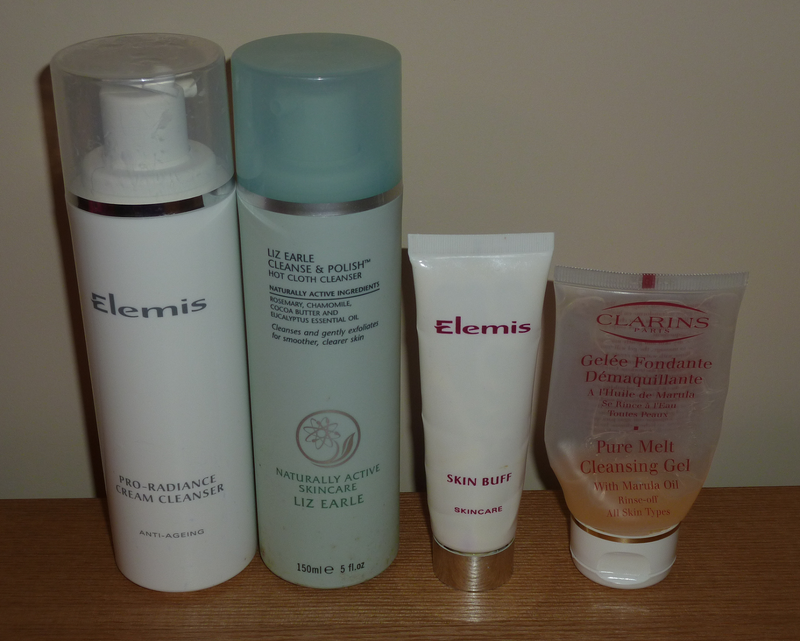 First of all, I have used up my all time favourite cleanser, the Elemis Pro-Radiance Cream Cleanser. This is one of those pump style hot cloth cleansers, similar to the Liz Earle Cleanse & Polish but it's much, much better! It's pricey at almost £30 per bottle but I've repurchased this several times and every time I go back to it, I notice the difference in my skin straight away. It's a gorgeous, thick cream that you apply to dry skin and massage in for about one minute then remove with a warm, damp cloth. I like to go old school and use a flannel. This feels so luxurious to use and it contains lots of beautiful ingredients such as sweet brazilian orange, lavender, ylang ylang, moringa seed peptide and assai fruit. This cleanser never leaves my skin feeling dry or uncomfortable after use like a lot of other cleansers do. It's absolutely perfect for my dehydrated skin and I'd love to try the new balm cleanser by Elemis as that looks even better! Liz Earle Cleanse & Polish is a really nice cleanser as again it has some great ingredients such as rosemary, chamomile and cocoa butter so you feel like you are putting goodness into your skin. I do enjoy using this cleanser and it also is good for my dehydrated skin but it's just not as moisturising and thick as the Elemis one. This one is less than half the price of the Elemis one though so I guess that's why there's a difference in the quality. I would still recommend this one as it helps keep my skin looking healthy. Elemis Skin Buff is a facial exfoliator I've had for a while as I forgot about it and just rediscovered it again. I really like this as it contains lots of very fine salt-like particles which do a brilliant job of sloughing away the dead skin on your face. Lovely! It doesn't leave my skin feeling tender or anything and as long as you moisturise afterwards, your skin isn't left too dry. 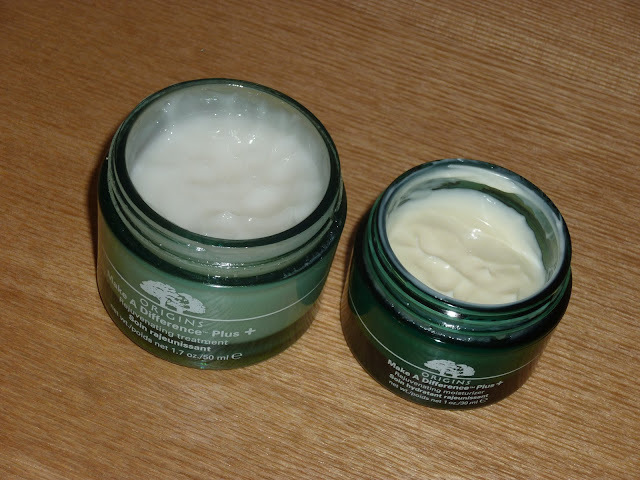 It creates a lovely base to apply moisturiser and makeup on to as the flaky patches are gone and fresh skin is revealed. This is a bit of an expensive one again with it being Elemis but you only need a little bit each time so it lasts months if you're using it once a week or so. The Clarins Pure Melt Cleansing Gel was a small version I picked up a while back in a special value set and stopped using due to buying more products but I went back and finished it off recently. The formula of this cleanser is so nice. You rub the gel into dry skin and it massages in like an oil. It feels like you are giving yourself a little facial. When you add water to your face, the product turns into a milk and is easy to remove. You are not left with oily patches! This one isn't good for removing eye makeup as it tends to sting that delicate area but my face feels clean and moisturised after using this. Another great one for dehydrated skin. I have an array of shower products that I've used up starting with the Soap & Glory Foam Call Body Wash. I got this in a set for Christmas but it normally comes in the pump style applicator which makes it super easy to use in the shower. I've had this fragrance before which is based on the "Fruitigo" scent containing lovelies like orange oil and fig. It's quite nice but I prefer some of their others such as the Sugar Crush one which is sweeter! 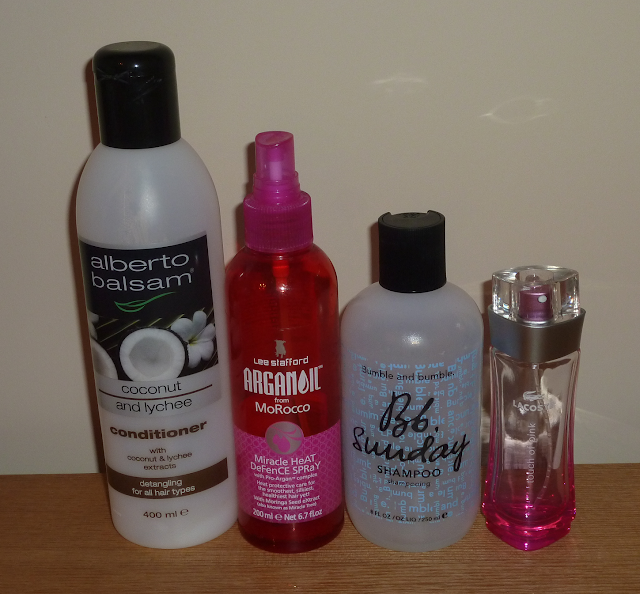 I love the moisturising effects of these body washes though as they keep your skin lovely and soft. I'll always repurchase these in their varying scents. 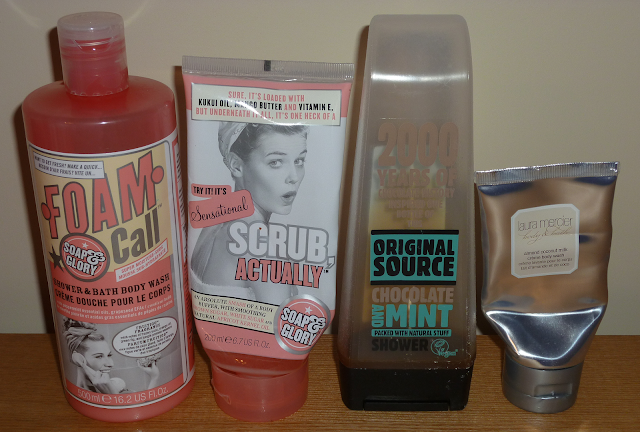 Another Soap & Glory product I used up was the Scrub Actually body scrub. I love the scent of this as it's quite tropical due to the mango butter and apricot kernel oil, it's definitely an enjoyable experience to use this. The other thing I really love about this is that it contains brown sugar and white sugar which feels like a thick paste so it does a great job at really exfoliating the body without having to scrub too hard or use too much. The oils and butters in this leave your skin feeling smooth but not greasy. The Original Source Chocolate and Mint shower gel was bought purely for it's fragrance. I didn't particularly need a new shower gel as I have quite a stash going but the chocoholic in me couldn't resist. It smells a bit like mint Matchmakers which to me is a good thing! It's not the most rich, lathering shower gel but I liked using it as it made me feel clean and smell good. It's pretty cheap too so its a good little treat. I used up the Laura Mercier Almond Coconut Milk Creme Body Wash from a set I bought from the Boxing Day sales. This is a rich shower cream with a gorgeous scent that smells like expensive cakes to me! I enjoyed using this as it felt really moisturising on the skin but I wouldn't repurchase this as it's quite expensive at £29.00 for 200ml and it would only last a few weeks! I featured an Alberto Balsam conditioner in my last empties post and mentioned I would like to try another scent so I picked up the coconut and lychee version. This was just as good as the mandarin and papaya one, it smells nice and does a fab job at hydrating your hair. Another great buy. I must have had the Lee Stafford Argan Oil Miracle Heat Defence Spray for a few years or so before finally finishing it. 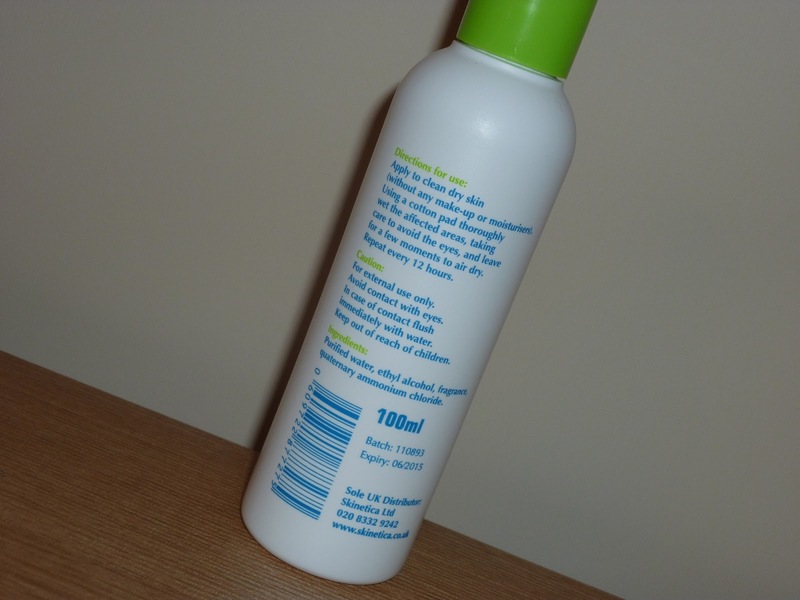 I used this before using hair straighteners and sometimes before blow drying my hair. It smells lovely and sprays a nice fine mist into your hair rather than creating damp, sticky patches as some heat protection sprays do! I feel like this does a good job at protecting the hair and I would definitely repurchase it. I have a mini bottle of the original one (without the argan oil) on the go at the moment. My fiance always comments on the nice smell when I use these! The Bumble and Bumble Sunday Shampoo was a product I lusted after for a while before I gave in and handed over my cash. It is massively raved about in the beauty blogging world and I thought it would be amazing. I have to say, it was a bit of a let down! It's basically a clarifying shampoo to help get rid of product build up from the hair and yes, I would say it does that job but so does other cheaper offerings. My problem was that I expected miracles! I have hair that gets greasy quickly and I have to wash it every day and bloggers were saying they could go longer between washes but it just doesn't work like that for me. I'm now using a Tresemme cleansing shampoo that I bought for a few quid and it's twice the size of this and doing the same job! I would still like to try other Bumble and Bumble products though. My last product is a perfume, a type of product I don't tend to get to the bottom of quickly as I have so many on the go at once! I got the Lacoste Touch of Pink not last Christmas but the one before and I was really pleased as I used to buy this in my late teens and loved it so it's been good as its a really nice girly, easy to wear scent but it also brings back fond memories. So that's me done, I can now get rid of another basket worth of empty packaging and continue my mission to use up more products. Hope you enjoyed reading about these products! What products have you been using up lately? Have you found any holy grail products you must repurchase or alternatively any let downs that you do not recommend at all? MAC and Essie Giveaway Winner! I would like to thank everyone who entered my MAC and Essie giveaway. It's been great hearing from you all and I wish everyone could win! Anyway, on to the bit you've all been waiting for. Congratulations Sophie of http://pocockins.blogspot.co.uk/! An email will be on it's way so I can get your choices and postal details.